Gold, Gold, Gold, its been a mad few weeks. We have never had demand like it. If you have ever thought of investing in Gold NOW is the time to do it. 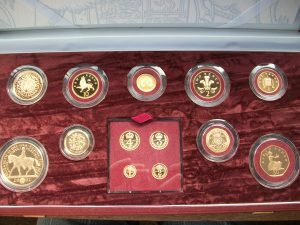 The above 13 coin set from 2002 has the equivalent of over 18 and a half Sovereigns of Gold in it! Our new list is a cracker, the biggest we have issued. We now have over 10,000 coins, of every sort. So get looking and we look forward to hearing from you.